Third release on Bandcamp by Smoking Time Jazz Club. Contrapuntal Stomp Smoking Time Jazz Club’s newest CD is a recording that will be mighty popular with the folks that crave red hot jazz music. Sarah Peterson and the band have everything it takes to turn out tantalizing dance tunes and they have put it all into this recording. 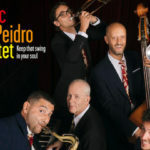 Songs from their favorite artists such as Sidney Bechet, Louis Armstrong and Bessie Smith capture the free wheelin’ feel and style of smokin’ hot traditional jazz and slow burning classic blues. Using tradition as a guide with a forward movement made sure footed by experience they have assembled a collection of traditional jazz songs that will tickle your feet with that swingin’ beat. So get in the mood to groove, pull up your socks and put on your dancing shoes and join the Contrapuntal Stomp.